Our word was fish. Plenty of wonderful suggestions flowed in via the comment box, but in the end, Zara’s “Any fish from Natchez” won out. You’ll find no complaints from me. I’d been to Natchez just a few weeks ago, even ordered the tile fish, and was blown away by the quality and freshness of their product. Would history repeat itself? Yes and no. No, in that the tile fish wasn’t the Catch of the Day last Tuesday. It was pompano. Yes, in that the fish lived up to my prior experience, and may have been even exceeded it. Natchez’s pan-seared pompano, a firm yet flaky white fish, proved to be just what I was looking for in a nice, light lunchtime option. The mild-tasting fish—which rested on a bed of green lentils—was elevated by Chef Jones’ brilliant use of a brown butter sauce that both added flavor and moisture to the lentils and pompano. Toasted walnuts also gave the dish a nice added layer of texture. 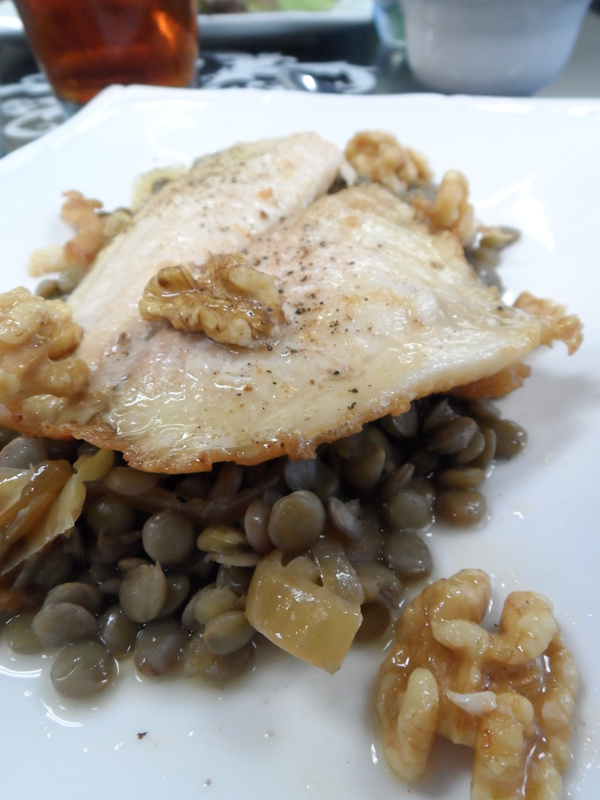 The generous portion of lentils resting under the fish were well-seasoned and tender to the bite. My slight criticism with the pompano dish was with its overall presentation. A contrasting-colored ingredient, such as a sliced roasted red pepper, needed to be on the plate to make for a more visually appealing dish. But make no mistake, the taste was fantastic…and when it comes to a truly great piece of fish, Natchez is your place.